A Salesforce KPI is a measurable performance metric used to monitor, analyse, and optimise the customer relationship management (CRM), including all relevant sales processes. Among other things, Salesforce metrics help the sales team to prioritise resources and leads. Lead Response Time: How long does the lead processing take? Follow-Up Contact Rate: Have leads been processed consistently? Sales Activity: What do the sales employees spend their time on? Average Contract Value: What is the Average Contract Value? Average Sales Cycle Length: How long does it take to close a lead? 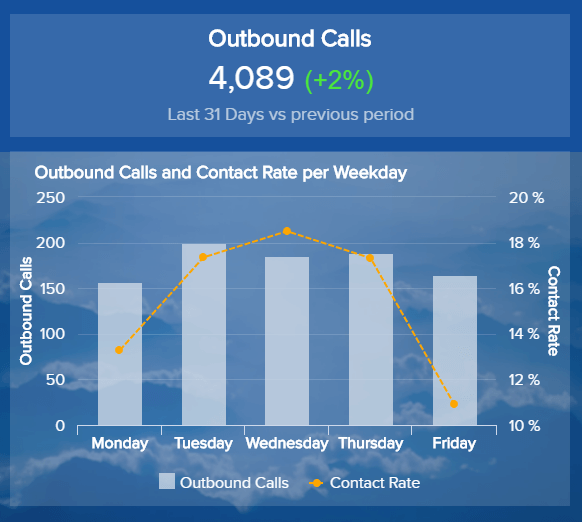 Outbound-Calls: Which weekdays are the most promising? 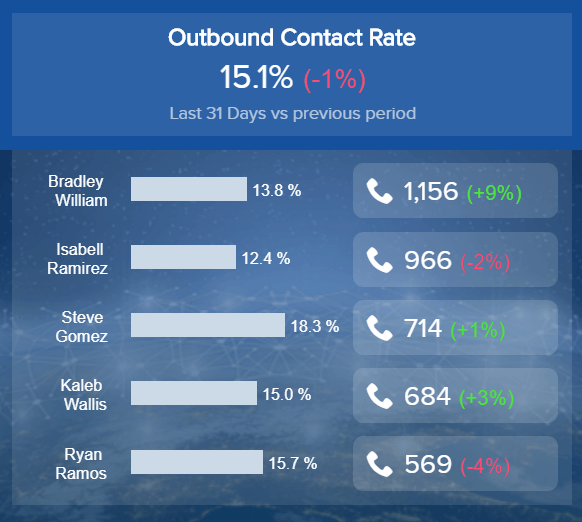 Outbound-Calls Contact Rate: Which sales representatives perform best? 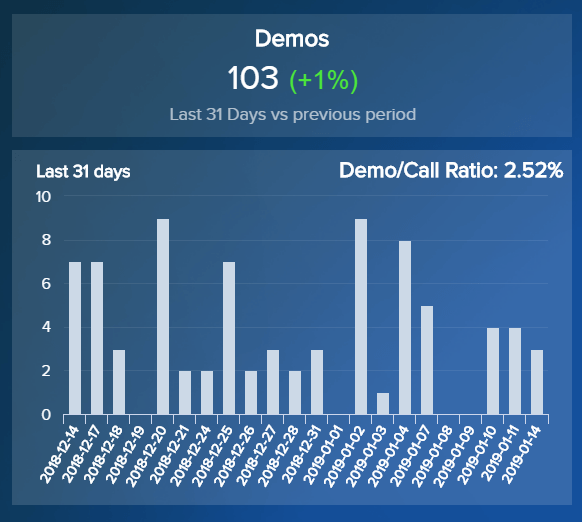 Number of Demos: How many calls you have to make for a product demo? Total Amount of Inbound Leads: How many inbound leads do you receive? Lead-to-Opportunity Ratio: How valuable is your average lead quality? 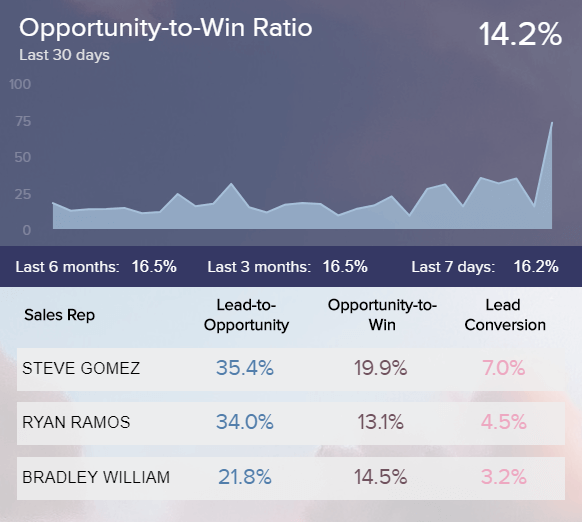 Opportunity-to-Win Ratio: How often do you close qualified leads? Lead Conversion Rate: How many leads are required for one new deal? How long does the lead processing take? 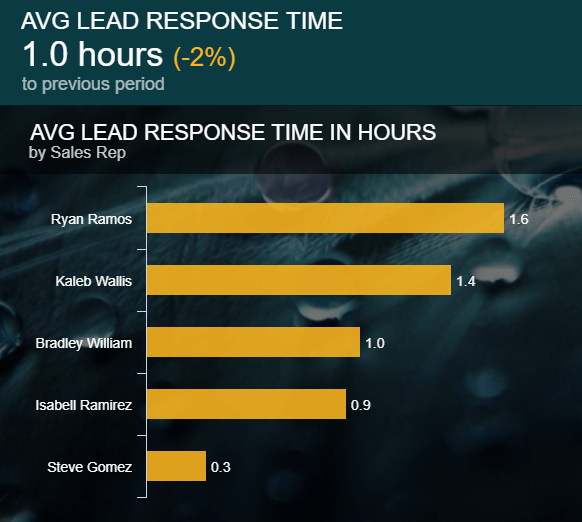 Our first Salesforce KPI is the average lead response time. Depending on the type of the lead and the specific scenario, the optimal response time can vary greatly. Whereas, for example, there is no reason to not react as quickly as possible to a request for an offer or a product presentation, this is a controversial topic when downloading a white paper or creating a free trial version of a software. When should I react? Under what circumstances is a telephone contact useful? If you have answered these questions for yourself, you should test different strategies and determine the desired lead response time. Test the different contact possibilities and various response times and analyse the effects. Then define clear goals for your target lead response time and monitor them on an aggregated basis, and for individual sales representatives. Have leads been processed consistently? 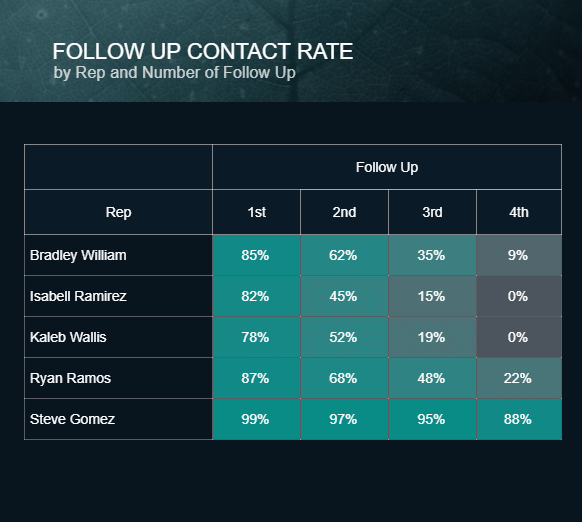 Our second Salesforce metric – follow-up contact rate – shows you the average number of contact attempts per lead made by sales reps. For this metric, it's also difficult to give a general recommendation about how many contact attempts you're going to make after simply annoying potential customers and the likelihood of closing a deal is more or less zero. However, it makes sense to analyse the individual follow-up contact rates more precisely and to determine specific best practices for the sales team. For example, it would be interesting to examine the percentage of contracts concluded after the third contact attempt, or whether a fourth contact attempt makes sense at all. E-mails and calls are the standard methods for contacting new leads. Try to agree on a uniform strategy within the team in order not to irritate the leads on the one hand, and on the other, to use available human resources as effectively as possible. What do the sales employees spend their time on? Basically, the main task of a sales employee is to conclude contracts and generate new sales, because, in the end, they are very often remunerated on a performance-related basis. However, it is often unclear what most of the time is spent on. We have shown you a possible distribution of relevant sales activities with our visual KPI example on the right: 31% telephone calls, 25% preparations, 24% e-mails, 16% lead research and 4% other activities. Ultimately, it should be ensured that sales staff spend most of their time on closing deals and sales-related tasks. 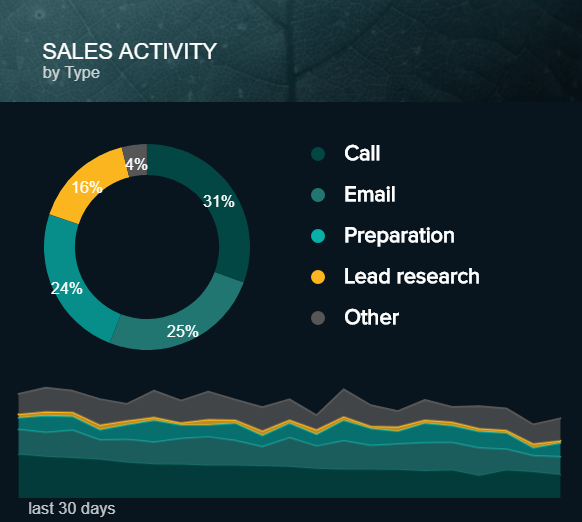 Even if tracking all sales activities is tedious, you should analyse the current status of your team in detail. This helps you to identify any ineffective processes or task assignments and to develop solution strategies. What is the Average Contract Value? Our fourth Salesforce KPI is the average contract value, which is relevant to sales performance in many ways: What is the average contract value of various products or packages? What is the threshold that the average contract value for certain products or services must not exceed in order to cover the costs incurred and generate profit in the long term? Are there significant differences in the average contract value from individual salespeople? 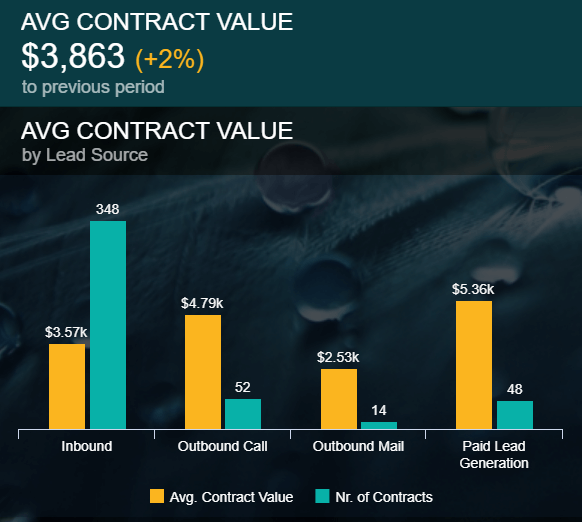 Which lead source has the highest average contract value? For which products are there above-average discounts? These are just a few interesting questions that can provide you with valuable insights in order to sustainably increase the average contract value. Ensure that no products or services from individual sales employees are sold below value by defining clear prices and transparent guidelines for discounts. How long does it take to close a lead? For each product or service, you should develop an individual sales cycle, one that can usually be divided into 4 to 5 main stages. We have provided you with an example on the right. In order to better understand the average sales cycle length and the individual influencing factors on these, it makes sense to aggregate the length of these main phases on the one hand, and analyse them for individual employees on the other. Maybe you invest too much time and effort in insufficiently qualified leads in the first stages? What influence does the average order value have on the average sales cycle length? What can you learn from the best salespeople who have a significantly shorter sales cycle? 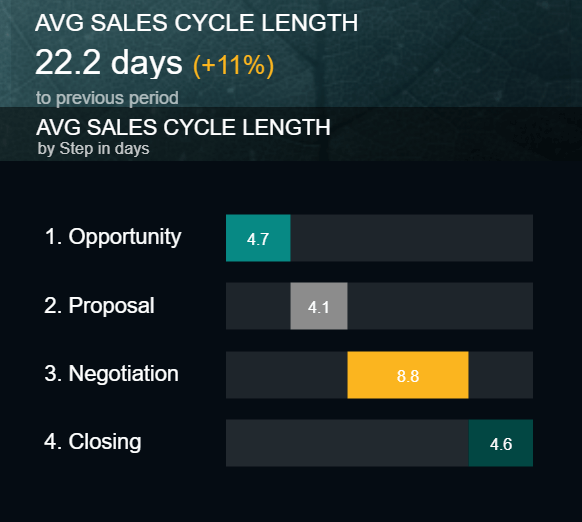 Analyse all potential influencing parameters on the individual sales cycle phases in more detail, in order to shorten your average sales cycle length in the long run. Which weekdays are the most promising? Our next 3 Salesforce Key Performance Indicators are used to monitor and analyse outbound calls and telephone cold calls. One of the biggest challenges for the sales department in telephone cold calling is to reach new interesting contacts and then arrange the first appointment. Therefore, you should first monitor the number of calls and then analyse the contact rate for the individual weekdays. For instance, in B2B sales it is often the case that the days Tuesday, Wednesday and Thursday are particularly promising. Accordingly, you should make the most outbound calls on these days and take this into account in your daily goal planning. Set clear quantitative targets for the number of outbound calls to be made on a daily, weekly and monthly basis. Consider potential influencing factors such as the day of the week or the local time. Which sales representatives perform best? As already mentioned, the outbound call contact rate can be influenced by numerous factors, such as the respective weekday, the local time, local holidays, the displayed phone number, but of course also by the behaviour of the sales employee. We have illustrated this in our visual KPI example: here the average contact rate is 15.1 %, with the lowest contact rate being 13.8 % and the highest contact rate 18.3 %. There are also significant differences in the number of calls made (569 vs. 1156 calls). With the help of interactive business dashboards, you can monitor all aspects of your outbound calls, and analyse the underlying causes in case of target deviations. Set yourself a realistic goal regarding your outbound calls contact rate. However, this can vary greatly depending on the country and product. Discuss best practices with your "most successful" employees throughout the team and then implement them. How many calls you have to make for a demo? Once the sales representatives have reached the desired contact person, they would naturally like to arrange an appointment for a product demo or company presentation. However, you shouldn't expect too much when it comes to cold calling. As a rule, with 100 calls you will at best be able to arrange 2-3 appointments successfully, because first of all, you will be able to reach a maximum of 15 to 20 % of the desired contact partners and then realistically arrange an appointment with about every tenth. Of course, these values can vary slightly depending on the industry and the product or service offered, but it would be absolutely utopian to assume, that you could arrange 30 appointments with 100 outbound calls. It makes sense to consider together the last 3 outbound KPIs discussed. For example, it does not make sense to increase the contact rate through questionable measures if this does not result in more demos being arranged. How many inbound leads do you receive per day? 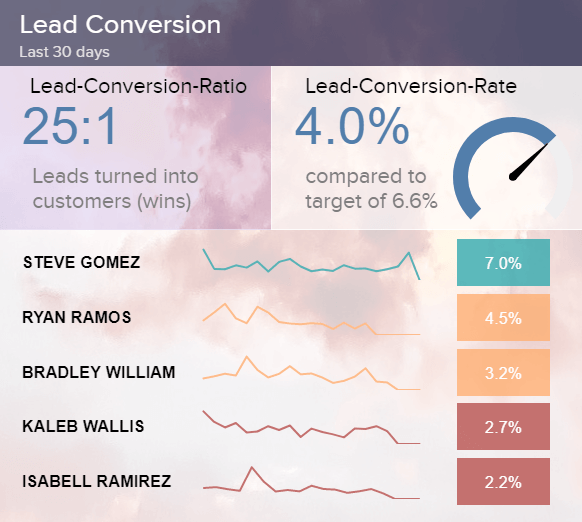 The following Salesforce metrics focus on inbound lead generation. In business practice, it has been found that inbound leads can often generate high-quality leads at a lower cost. However, to effectively plan your sales team's workload, you first need the average number of inbound leads per day/week/month. However, in the rarest of cases, it makes sense to transfer all inbound leads directly to sales without qualifying them further. More importantly, they have to be transferred to the so-called SQLs (Sales-Qualified-Leads). In this stage, lead-nurturing also plays a significant role, as inbound leads are often at the beginning of the customer journey. When planning resources for inbound lead management, effective communication between the marketing and sales departments is of key importance, as too many or too few inbound leads will ultimately under – or overburden sales. How valuable is your average lead quality? 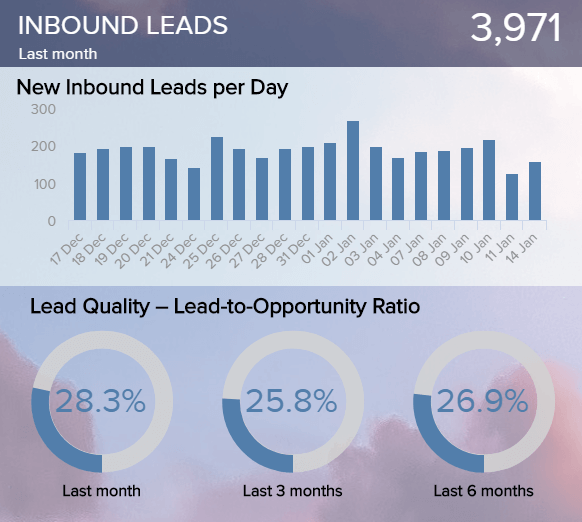 You can monitor the lead quality of inbound leads using the lead-to-opportunity ratio. This reflects the relationship between SQLs (qualified leads) and all inbound leads received (initially unqualified leads). Of course, this ratio is strongly influenced by the selected lead qualification strategy. As a rule, you should use criteria that are as objective as possible, and develop an automated or even artificially intelligent lead scoring model in the long run to avoid the influence of subjective factors. Many companies still work with the BANT method, which is no longer unquestionable. Test and compare different lead qualification methods. Avoid subjective criteria in the scoring model so that you can use the lead-to-opportunity ratio to evaluate lead quality in the long run. How often do you close qualified leads? 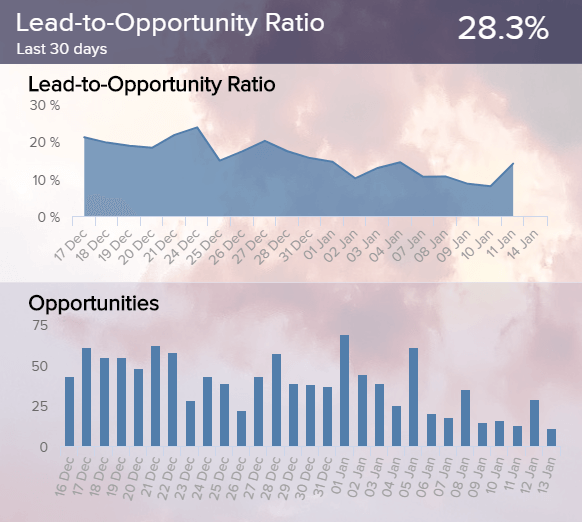 This Salesforce KPI shows how often salespeople successfully close a contract with an already qualified lead (SQL or opportunity). This also reflects the quality of the selected lead qualification. Here, however, it is often a trade-off between a too taut qualification of the leads at the beginning of the funnel – which could lead to the exclusion of some potential customers – and a too loose qualification, which could lead to a lack of prioritisation and, possibly, to a waste of valuable human resources. If you use a standardised lead qualification, based on objective criteria, and the opportunity-to-win ratio for individual sales reps is very different, you should analyse the underlying causes. The higher the opportunity-to-win ratio, the more effectively salespeople use their existing resources for qualified leads. A very low opportunity-to-win ratio could be due to poor or incorrect lead qualification. How many leads are required for one new deal? The lead conversion rate indicates what percentage of all (unqualified) leads can be converted into paying customers. Of course, this is the main business objective, which is why this figure is also the most important of the last 3 KPIs discussed. But as is well known, many roads lead to Rome and so is the case with the lead conversion rate. Test and analyse different lead qualification methods and different sales measures to increase your lead conversion rate in the long run. Also, compare the approach of individual salespeople, especially if you identify significant differences as in our example. The higher the lead conversion rate, the more effective is your overall lead management and, usually, also the quality of incoming leads. You can also use this metric to determine the number of leads you need to achieve your sales goals.